It appears that 10-4 is my number, going back-to-back weeks with the same result. I’ll take it and run as if I were a gambling man, I’d be in the black. I again feel good about my picks this week and I think I have some great locks for players. 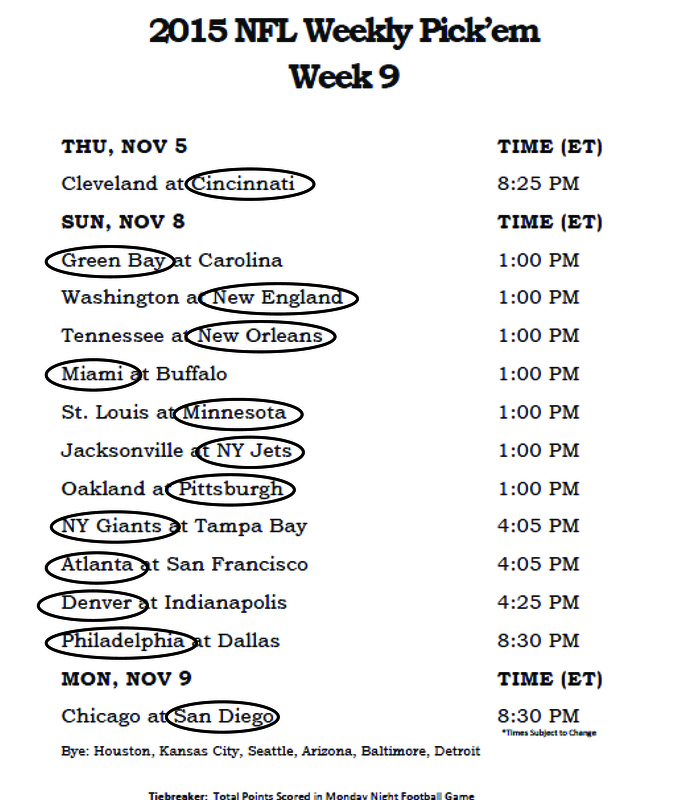 So, without delaying this further, here are this week’s picks. There are a few iffy games, but I’m confident! 2.) Drew Brees vs. Tennessee. Well, nobody saw what happened last week coming, nor d0 we expect him to replicate what he accomplished. That being said, the Titans are in disarray and are again one of the league’s worst teams. Look for Breezy to put up a big week again. 3.) Jay Cutler at San Diego. Jay who? Yes, that guy. Jay Cutler. He came to life last week and has a juicy matchup against a bad Chargers team add to that the Chargers are missing their captain, Eric Weddle. The San Diego fan base has all but given up on their team as is evident by the loss of home field advantage, it will almost be another home game from the Bears. 1.) Devonta Freeman @ San Francisco. The Niners benched their starting quarterback Colin Kaepernick and traded their club house and team leader, Vernon Davis. They are a mess and for the first time in over a decade not the best team in California. Freeman is a MUST go. 2.) Mark Ingram vs. Tennessee. The Titans have the worst run defence in the league and took notice about what Brees did through the air, so look for them to protect themselves against the pass, which will open up a bunch of lanes for Ingram. 3.) Jonathan Stewart vs. Green Bay. The Broncos ran rickshaw over the Packers last week and they’ve struggled to run the ball this year. Stewart should find a lot of room out there, especially if Newton is going. 1.) Julio Jones at San Francisco. Much like Freeman, Jones is going to have a monster week. no need to re-iterate what was said above. 2.) Antonio Brown vs. Oakland. With Vick out of the picture, Brown becomes the man again in Pittsburgh. He and Big Ben connected early and often last week, look for much the same. 3.) Amari Cooper at Pittsburgh. Cooper got a ticket off Revis Island and is eager to return to his old ways. He faces a better matchup and should do well this week. 1.) Tyler Eifert vs. Cleveland. Eifert is leading among the lead leaders in TDs this year, not just for tightends, but for the entire league. He has a cream puff matchup this week, I predict he finds the end zone twice. 2.) Martellus Bennett @ San Diego. As mentioned above, San Diego is in shambles. Bennett will dominate. 3.) Ben Watson vs. Tennessee. The Titans are bad, read above. Watson is a must start. New York Jets. They play the Jags this week, the Jags are bad, the Jets D is great…Do the math?